Even though pc sales are struggling, tablet sales are increasing rapidly. 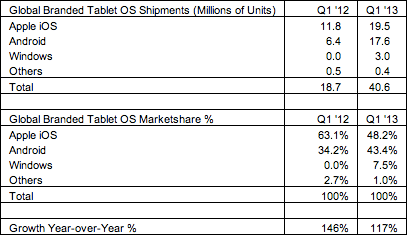 In Q1 2012 around 20 million tablets were sold, while in Q1 2013 over 40 million were sold. Tablets are becoming increasingly more important. Pricing is very important to tablet buyers since the Google Android tablets have been selling that well. Apple needs to come up with something fresh if they want to maintain or even increase their market share. Windows tablet sales haven’t been as bad as some believed. Of course there’s still a lot of room for improvement, but I think that it will keep gainimg market share. Especially when prices will become more competive and when the number of good apps increaes. Windows 8 has been blamed for bad PC sales, but Apple Mac sales fell 7.5% as well. I believe it’s just that customers rather have tablets and smarphones instead of PCs. Also it might be possible that the PC market just has become saturated.